In a previous post, I looked briefly at MicroPython and it’s place and role in the Internet of Things (IoT) arena. In this post, I’d like to walk through the process of getting a NodeMCU ESP8266 device flashed and up and running with MicroPython. Then we’ll do the, almost required, IoT version of “Hello World”… a blinking LED light. There are multiple micro-controller options available for using MicroPython so why, you may ask, have I decided on the NodeMCU? First and foremost they are inexpensive. You can find the NodeMCU ESP8266 development boards on eBay for under $5.00. Granted that is from a factory overseas, but for under $10.00 you can get one on Amazon. The second reason I like this board, in particular, is that it has LED lights built into the board so I don’t necessarily need to break out LED bulbs and resistors. Another big plus is that it is WiFi ready and with MicroPython that means that one can set up a web interface with the board and also readily make truly connected projects without additional hardware. All that said and done I’ll be using a basic NodeMCU ESP8266 device for this tutorial. Feel free to use a different physical device with the same chip, just know that some settings may be different based on the physical device configuration. The board has a USB interface which, when connected to a PC provides power. We obviously need to get a copy of the MicroPython firmware. 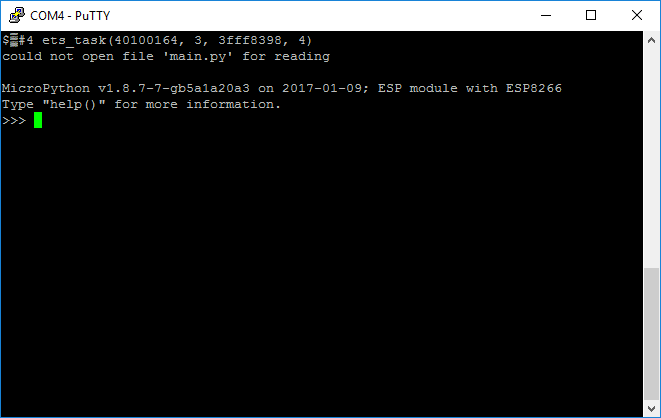 It comes in a .bin file format that can be loaded directly to the ESP8266 device and can be downloaded from the MicroPython site here. For this tutorial, I will be using the esp8266-20170108-v1.8.7.bin version of firmware. You will want to download that to your computer and remember where it is saved. This version of esptool supports Python version 3.4 or newer. The filename of the firmware should match the downloaded firmware. Assuming you don’t get any errors during the flashing process, you now have a NodeMCU ESP8266 device running MicroPython. Pretty slick, eh? We can now connect to the device using a serial terminal tool, like PuTTY for Windows, the screen program on Mac, or something like picocom for Linux. I’ll be using PuTTY since I’m currently on a Windows 10 machine. We can start entering in Python commands on the device itself. Let’s have our device do the IoT version of “Hello World” and turn on one of the on-board LED lights. These lights are controlled through General-Purpose Input/Output (GPIO) pins and there are two of them on board. GPIO 2 controls a small blue LED on the board. In the REPL then, we want to be able to turn the light on and off. That can be done by altering the state (electrical charge) provided to the GPIO pins, typically by changing the state from low to high and back to low. Here is something that I discovered when working with this particular LED and GPIO setting and board. On this board, the LED on GPIO 2 (and 16 for that matter) is wired between the pin and the power, so when we set the pin state to low, the light is activated, and when set to high, it is off. There is active development on this issue and firmware updates may have already addressed the issue. However, if one connects an external LED light to, say GPIO 5 along with the required resistor (~300+ ohms), we get the expected light on with a high state, and off with a low state. MicroPython code – Try it Out! There we have it! We have taken a NodeMCU 8266 device, flashed it with MicroPython, accessed it through the serial port, and with minimal code, turned the on-board LED lights on and off. Congratulations on your first venture into IoT and Python! There is a lot more that can be done with this $5.00 board and I think I will spend some time experimenting with it a bit. I’ll post my results and findings here as I work through the process. Great tutorial!! I’ve bought the NodeMCU on AliExpress for 3,29€. It’s not that easy to find a dumb-save manual how to start with it. Thanks for the feedback. Pleased to hear you found it useful. Note that the high() and low() procedures haveneen renamed on() and off() in later versions of MicroPython for ESP8266. You can enter this program using your favorite text editor (like Notepad or the mu editor) and save it with a ‘.py’ file extension. Then use the ‘ampy’ utility to download the file to your ESP8266 and run it. To break out of the while True: loop, enter ctrl-c. The ‘ampy’ utility is downloaded from GitHub and is written by Tony D of Adafruit. Tony D has several good (if dated) videos on MicroPython including one on ‘ampy’. Go to YouTube and search using keys like ‘Tony D’, ‘ampy’ and ‘MicroPython’. I also like the ‘mu’ text editor for MicroPython which runs from your local harddisk on you PC, and has an easier download procedure than online editors have. Previous Previous post: New version… new features.